Self Portrait, 1958, graphite on paper, 10 ½ x 8 in. A pair of self-portraits welcomes us at the entry to the exhibition. 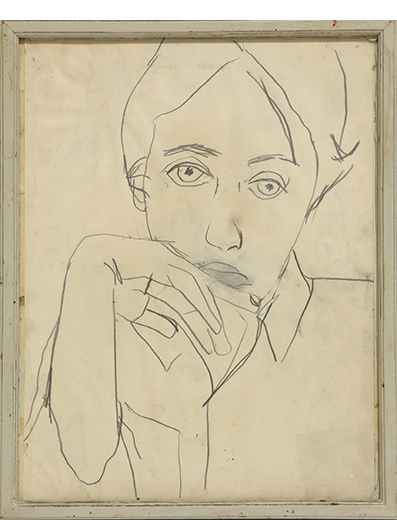 A small work in pencil, Self Portrait (1958), reveals the artist at the age of 20, her chin resting on the back of her hand. Strong geometric lines in hair and shirt collar meet delicate lines tracing out contours of the face, a smear of grey above the eyelids the only shading. Twenty-five years later, Self Portrait #2 (1983) captured Brown's mature likeness in pastel on a surface ten times larger. Her hair is a thicket of orange, purple and wisps of blue-gray. Brown's remarkable blue-green eyes here look inward and unfocused, rimmed with cobalt blue; her iconic beauty spot sits poised on cheekbone. Brown emerged on the scene, fresh out of art school in 1959, and soon had paintings in many major museums across the country, along with representation in New York at the George Staempfli Gallery. She was included in Young America 1960: Thirty American Painters Under ThirtySix at the Whitney Museum. No mean feat for any artist, much less a 22-year-old. Like many ambitious female artists, Brown skirted the issue of feminism throughout her career, avoiding the label of “woman artist” yet constantly serving as a role model by example. The early work that fueled her rise to fame belonged to the second generation of Bay Area Figurative painting. A student of Elmer Bischoff's at SFAI, then California School of Fine Arts, the diminutive Brown slathered oil paint across yards of canvas with the best of them, creating paintings at once image and object, with a physicality visceral presence that conveys a sense of the joy of painting. In Living Color features works from every stage of the artist's development. Among the strongest are those from the earlier stages of her career. 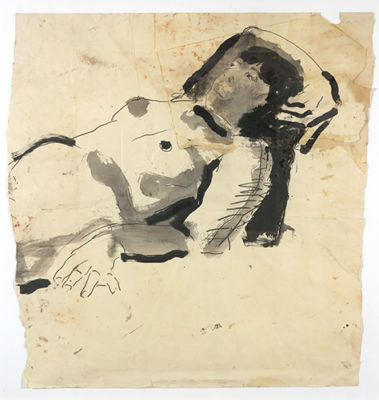 Reclining Female (1963) offers dramatic contrasts with a dark mass of ink, a thick mane of hair, coiling around a head, its gaze shifted away. Vigorous lines of graphite articulate the forms, while broad marks of ink wash define areas of shadow. Untitled portrays an androgynous model standing with arms akimbo, her direct gaze challenging the viewer. White and grey paint are energetically, even brusquely, applied, as ripped up pieces of paper further activate the surface, sharing many of the same characteristics seen in the tortured plaster figures of Manuel Neri whom Brown married in 1962. 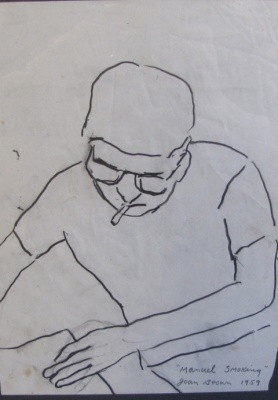 Manuel Smoking, 1959, graphite on paper, 9 3/4 x 7 1/2 in. Smoking (1959) offers rudimentary lines in graphite, dividing the roughly-torn paper into geometric forms, while sketching out a view of the artist concentrating on a drawing. Brown's ability to convey nuances of emotion and presence with an economy of means is startling. After she and Neri divorced in 1966, Brown became disenchanted with the bravura impasto and the gestural technique that brought her fame. Her abandonment of it, she explained, came as a result of learning she could “fake spontaneity.” Reinventing herself, she spent a year working on a solitary still life of cucumbers and eggs. With phenomenal success under her belt at such a young age, what was she going to do for an encore? Working through a period of obsession with animal imagery, including sketching at the zoo, or at the buffalo paddock in Golden Gate park, Brown discovered a kinship with the animal world that remained central throughout her work, at times standing in for, or fused with, the human presence. A pair of sensitive sketches, Buffalos I and II (1966), are included at RAC. 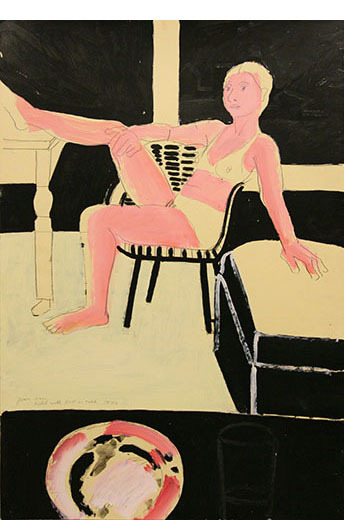 Joan Brown Model with Foot on Table, 1973, acrylic, graphite, and ink on paper, 36 x 24 in. space of Asian artwork. 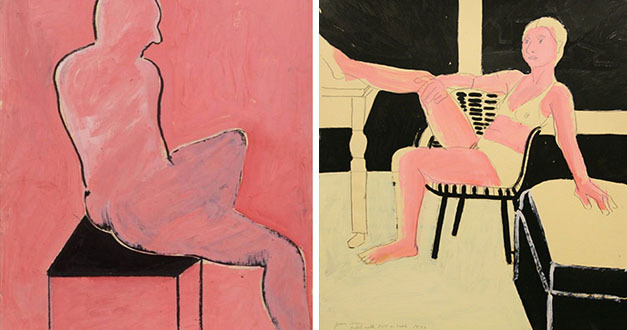 This articulation of the figure by means of line and color, rather than traditional modeling, combined with a graphic style and use of pattern, recall both the work of Henri Matisse and the Pattern and Decoration Movement of the 1970s. Model with Foot on Table (1973), a work in acrylic, graphite and ink, reveals Brown's passion for drawing, and her keen appreciation of the human form. Hot pink flesh vibrates against unexpected pale areas of skin, activating a geometric ground in cream and black, and a lively pattern of choppy black stripes suggesting a bucket chair — along with a piano keyboard. Brown loved to travel, and in the 1970s she found a new way of expressing her internal and external journeys in large-scale works in oil enamel on canvas. These playful images, recounting romantic trips to Europe and Egypt, found a welcome audience at SF's Hansen Fuller Gallery, and catapulted Brown back to the center of the Bay Area art scene. Teaching at the UC Berkeley, she was in 1973 the first female professor appointed to a tenure-track position in the art department. Students found her youthful enthusiasm, compassion and joie de vivre as infectious in the classroom as it was on the canvas. David with Greek and Egyptian Sculptures #1 (1976) presents a somewhat bemused male figure contemplating a classical sculpture as a suspended figure in gray-green seems to dive from above – a painting that reflects both her fascination with antiquities and a life-long passion for swimming. 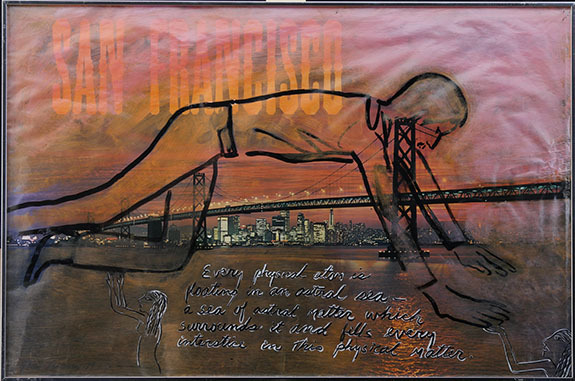 David in San Francisco #2, painted on a kitschy travel poster, suggests a journey ultimately more spiritual than physical. The figure hovers as though floating or flying over the Bay, with small Egyptian female figures delicately supporting his shin and hand. His body mingles with the Bay Bridge above a night skyline bathed in an orange-and-magenta hued sunset. Scrawled cursive text quotes Theosophist Charles Webster Leadbeater's thoughts about the astral plane. Brown's life as she matured and settled down became both more spiritual and more ascetic. Gone were the days of smoking and drinking like one of the boys, of hanging out in bohemian settings. She even gave up meat, though not her snakeskin boots. She wed her fourth and final husband, police officer Michael Hebel, in 1980 — the same year she became a devotee of Indian guru Sathya Sai Baba. Her work subsequently became a vehicle for spiritual transcendence, well before Eastern disciplines such as yoga and meditation had filtered into the mainstream. Brown was working in India, installing an obelisk at a museum at Sai Baba's ashram, when she was felled by a turret that took her life, a tragic ending to a life with many dramatic twists and turns. A vitrine near the entrance to the gallery displays an assortment of photographs of the artist at various stages of her life, as well as a charming letter— in pencil on sheets of 3 x 5-inch paper—to her gallerist George Staempfli circa 1960. Early announcements for juried group shows at RAC document Brown's participation. She was excited to share with her dealer that she had been awarded a $50 prize for her abstract expressionist painting, Brambles (1957). How fitting that the same venue that provided such welcome early support now preserves and promotes the legacy of her work. Joan Brown: “In Living Color” @ Richmond Art Center through November 11, 2017.